Elizabeth Townsend was a stay-at-home mom when she stumbled upon the trend of chalk painting while researching how to breathe new life into an old piano stool. “I had never heard of it,” she says. “I thought it was paint you could use and then write on with chalk, but I realized it was a whole art medium.” While chalkboard paint makes any surface into a chalkboard, chalk paint is used to create a matte, chalk-like finish on furniture or decor. 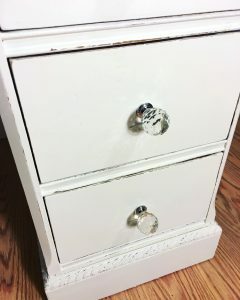 Unlike traditional latex paint, chalk paint can also be manipulated by watering down before applying or distressing after the coats of paint have dried, giving the painted items a “shabby chic” look. Just three years later, what began as a hobby to redecorate her home has turned into a successful business. In July, Townsend opened the White Door Home Store on Route 1 in Saco, where she sells refinished antique furniture, stocks Miss Lillian’s NO-Wax Chock Paint and a well-curated selection of home goods. 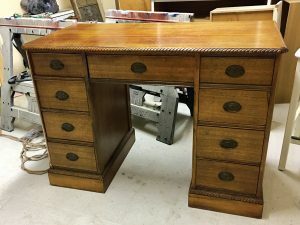 In the back corner of her shop is a workbench where Townsend frequently has projects in progress and she uses those projects as an opportunity to show customers how easy it is to paint furniture. While Townsend is excited to see customers buying up her reimagined furniture, she can only turn around so many pieces to stock her store. For that reason, she started hosting instructional classes this fall and has provided this DIY instructional for you to try at home. Gather your materials and set up your painting workspace with everything in reasonable reach. Start by removing all drawers, doors and fixtures. Use painter’s tape to label drawers and fixtures if needed to help in the reassembling process. Clean the piece of furniture well with a mixture of vinegar, dish soap and water to remove any dust, hair, oil or dirt. After the first cleaning, scuff the entire piece with a sanding block. Clean the piece of furniture for a second time to remove any residue from the sanding process. Townsend emphasizes not to cut corners when prepping the furniture. Any imperfections may affect the paint’s adhesion during the next steps. The first coat of paint on your furniture will actually be a coat of primer, which will help the paint adhere to the furniture. Once the primer dries, you can finally crack that jar of Miss Lillian’s and apply a thin, even coat of paint on all surfaces. After the coat is applied, wait at least one hour and then use a sand sponge to lightly sand the painted surfaces. Dust any residue from the sanding process before proceeding to your second coat of paint. Repeat the process from the first coat for the second coat. The third coat of paint should be your final coat. Allow the piece of furniture to dry for at least 24 hours after the final coat. 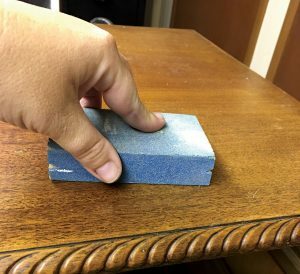 If desired, use 200 grit sandpaper to distress raised features, corners and other areas of interest. The extent to which you distress the furniture piece is based on your preference. After all that work to paint your piece of furniture, protection is suggested. Townsend recommends a topcoat poly for a satin shine, or if preferred (and despite the name) you can use a furniture wax. The topcoat you would paint on just like the previous coats of paint you applied. If you opt to wax, you will apply a thin layer and then buff with a clean rag. 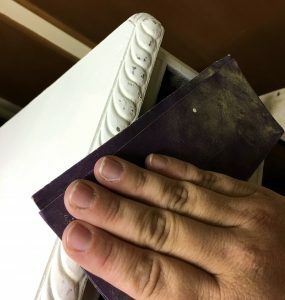 In the event nothing will be placed on your piece of furniture and the paint provides, you may be able to skip this last step. Reassemble your piece of furniture, from fixtures to placement of drawers, and enjoy! • Make sure primer, paint and poly are all well mixed before you dip your brush in. • Use a plastic bowl or painter’s cup rather than painting out of the can/jar to preserve whatever paint you don’t use. • Add water teaspoon by teaspoon to the Miss Lillian’s to thin the paint and stretch the square footage it will cover. • Don’t skimp on the brushes. Good quality brushes make the difference and will last if you take good care of keeping them clean. Have a variety of brush sizes and shapes on hand and use the best size/shape for the section of furniture you are working on. 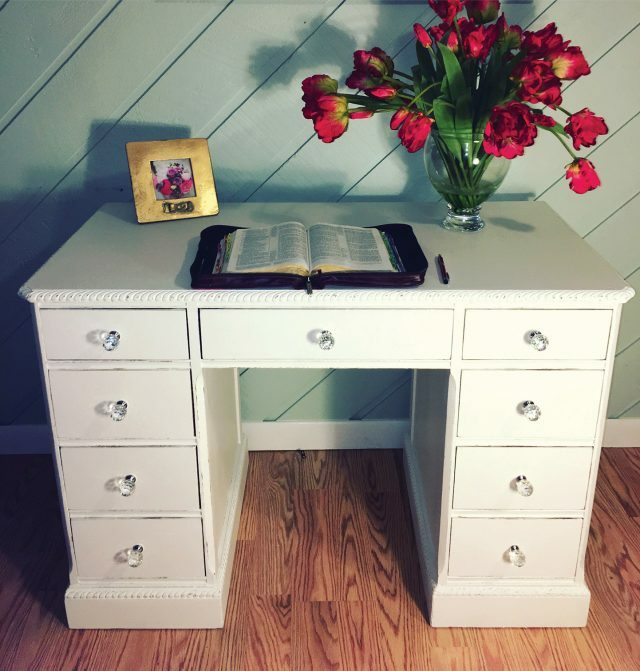 • Use something to raise your piece of furniture off the ground so you are able to paint at eye level rather than being on your knees or hunched over. • Be patient, but don’t be scared. 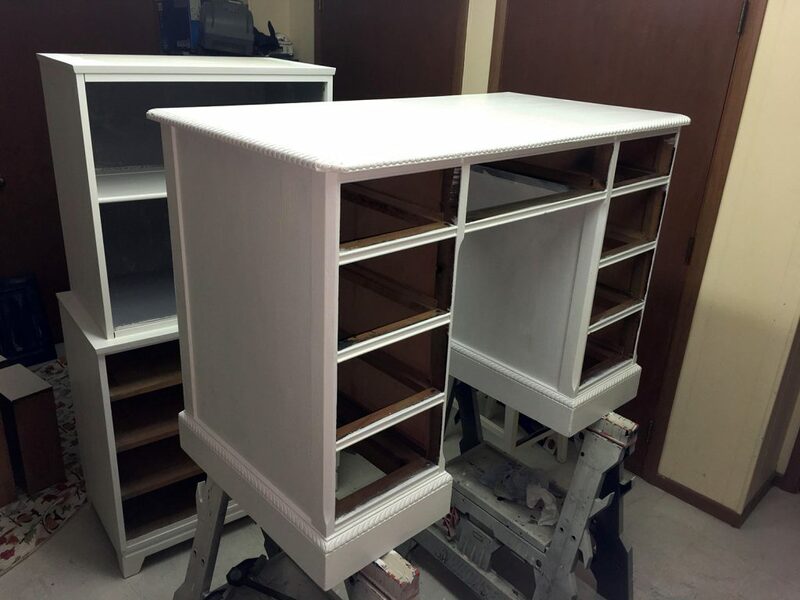 Painting furniture is really easy if you follow the steps and don’t rush the process.